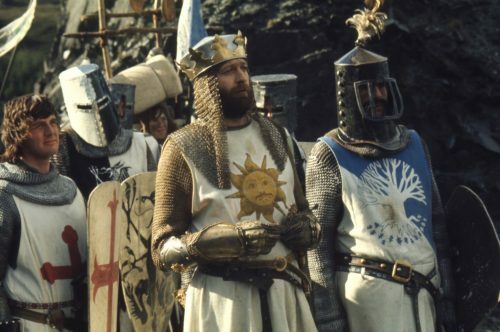 With History being made, again, with the 40th Anniversary release of Monty Python and the Holy Grail hitting cinemas, we have been sent over the following, very useful, guide that could save your life. We have since learnt that European swallows cannot carry coconuts, although the debate on African swallow still rages on. With thousands dying every day, who’s going to miss one measly old father in law? Sleep with one eye open. Perseverance and resilience can be a virtue, but when limbs are being severed, best call it a day. Witches burn because they’re made of wood and also weigh the same as a duck. Best keep some around for when the fire get low. 5. Don’t let French taunting get the better of you, unless you want farm animals catapulted at you. If battles were won by verbal insults alone, the French wouldn’t be known as “cheese-eating surrender monkeys” Also take their comments about Grail ownership seriously, it may save you time looking for it. The gate keepers of the castle Anthrax can result in minor peril – Be warned. Those who fail to build a rapport with their Shrubber can envoke the wrath of the Knights who say Ni! When wooden models of them aren’t being launched from a French castle crushing your servant, they’re tearing the throat of your fellow knights. Keep your Holy Hand Grenade of Antioch close! On slip up on the bridge of death can mean life or (unsurprisingly) death. Don’t go around killing local historians and you’ll probably be safe with this one.